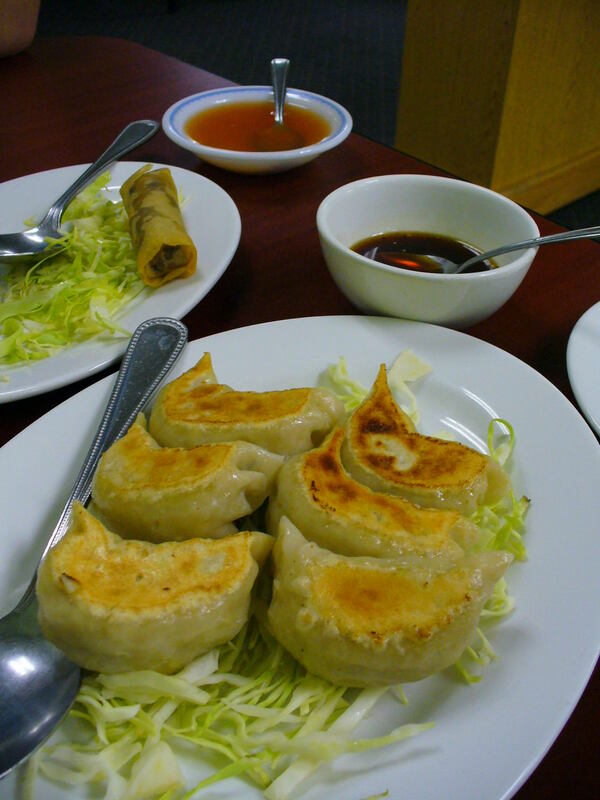 Love it or loathe it, Vegetarian House is a Portland veg*n staple, not to mention a NW Veg Business Partner. Until my most recent dinner visit, I tended to lean more into the loathe brigade. I think the lunch buffet is decent enough, and dig that it’s entirely vegan, but I never found it to rock my tastebuds, or come even half way there. I’m not here to say it recently did, but I did have my best dining experience there yet. Located in Chinatown, the restaurant looks like you might expect a Chinese restaurant to look – I can think of many I’ve been to that are similar. Vegetarian House is apparently all vegan now, except for their crab rangoons which contain dairy. Previously, there had been tales of “whey chicken”, and I admit I checked out there front room’s freezer on a label-reading spree. I had never seen this “Vegan” brand before, and it was extensive – different types of faux chicken, fish, shrimp and beef. 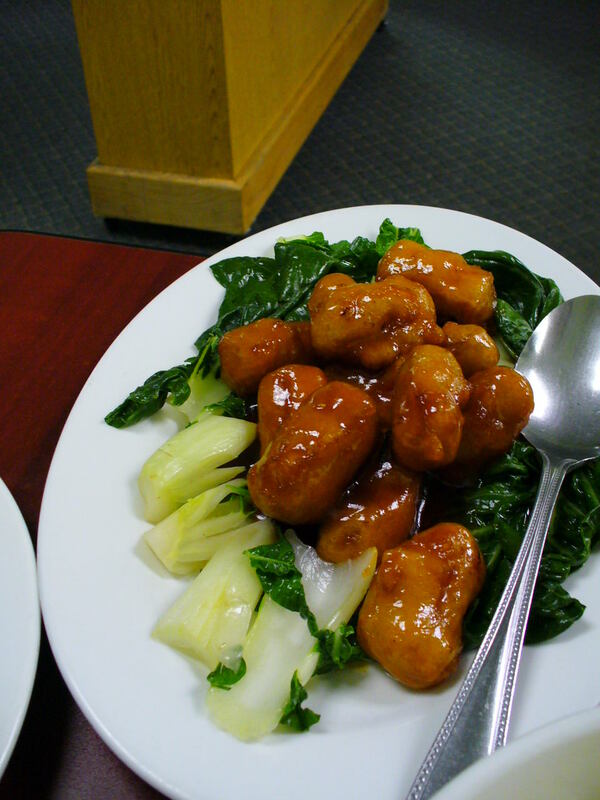 This time I ordered the Sesame chicken, and my partner ordered it as well – only “mild”, since he’s a wimp. The small nuggets were battered, fried and smothered in a spicy sweet and sour sauce – it seems that one can not go wrong with this combo. Seriously, look for those steps on a menu and you’re guaranteeing yourself deliciousness, if not a bloated stomach later on. Now, this sauce doesn’t top the Sesame tofu at Bay Leaf for me, but as for my experiences with Vegetarian House, it rocked. The Sesame chicken comes with a side of broccoli, and rice is brought to table in a bowl for sharing. It was honestly a little on the spicy side, but that’s clearly marked on the menu and other options, such the lemon chicken and orange chicken, give a sweet sauce without the heat. We didn’t order any appetizers, but the basic spring rolls aren’t anything I’m tempted to eat when I’m not at the buffet. Another friend ordered the Tofu and Vegetables – which was mediocre at best, and that’s trying to forget about the tofu. The tofu appeared and tasted lightly pan fried, but then soaked in the plain stir fry sauce it become an uncomfortably moist bite. 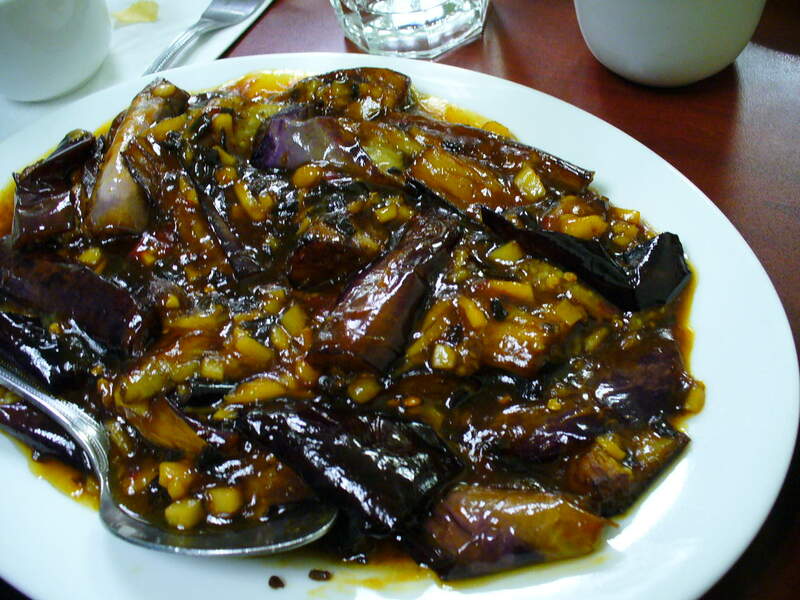 I’ve also tried the Tangy Eggplant, which did nothing for me. The sauce seemed off, and the eggplant was a little too melt-in-your mouth. 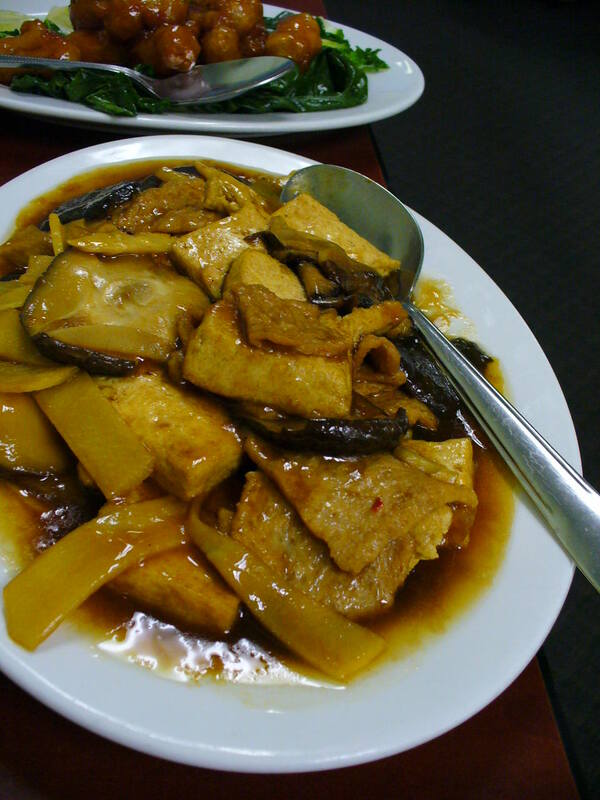 It seems that the tofu dishes may be the most hit or miss, but people do rave about the veggie shrimp and House Specials. With entrée prices ranging from $7.95-$14.95, it’s best to go with friends and try a variety of favorite and new dishes. Portion wise it’s smart to share as well, as portions are not very large considering the price, and if you share you can even things out. Quality wise, you up the odds of eating something you actually enjoy. It’s great to have downtown, but not someplace I’d frequently justify the price for dinner. I’m not usually a huge fan of Chinese food (with good Thai, Indian, Lebanese, etc. so plentiful here) but I have to tell you every single photo looks delicious! Maybe I’m just really hungry. The tofu in brown sauce especially. I’ve only been for the lunch buffet, maybe now I’ll try dinner. I wish they did delivery! FYI, I think quality-wise, your odds are higher at dinner. I think the lunch buffet has improved, but it’s still average, at best. It’s not awesome, but I still eat it regularly. An all vegetarian chinese restaurant, how can that go wrong? Well, for starters it can have a giant poster of a blond Chinese lady with “Supreme Master” written on her forehead staring at you throughout your entire meal. For some reason the eggplant dish looks scary to me. Also, 14.95 seems REALLY expensive. Well everything here looks delicious… I can’t tell if it really tasted that good or if it’s just that you took some amazing photographs! Seriously, very nice photos. We love this retaurant, everything we have tried is delicious! 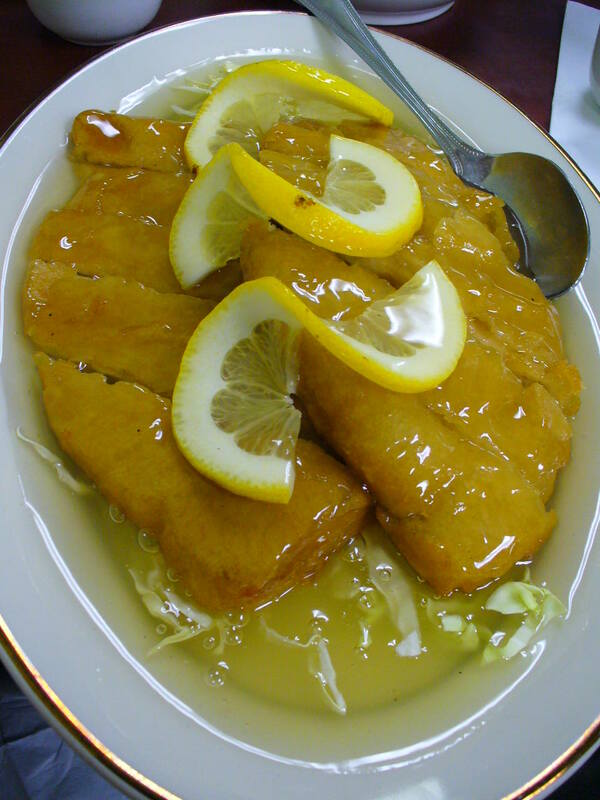 Our favorites are the Sesame Chicken, Birds Nest and the Lemon Chicken. One dish feeds 2 adults and a toddler in our family. They are also very freindly and are dedicated to veganism. It is definitely worth a try! We also took some of our family who are avid meat eaters and were expecting to hate it but every one of them were pleased. Enjoy!!! In my opinion the reason to go to Vegetarian House is the fried banana or candied banana for dessert. I ate fried banana on my first trip to San Francisco as a teenager and was changed forever. I’d never eaten one as tasty until visiting the Vegetarian House. It is also comforting to know that I am supporting a weird cult when eating out. Lol. firstly, I am so hungry after looking at those pictures. Secondly, I’m making a fan page for the Vegetarian House on Facebook and I was going to use your pictures but thought I should tell you… I hope that’s cool.